Golf - 06. February 2008. 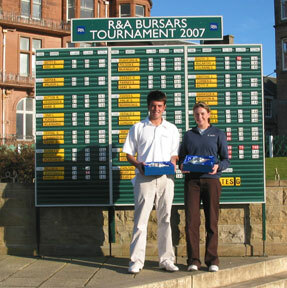 6 February 2008, St Andrews, Scotland: The R&A has announced that a record number of 91 students will, this year, receive Foundation Bursary funding. Individual bursaries range in size from £500 to £3,000. Students from Belgium, Iceland, Italy, New Zealand and Zambia are amongst those awarded bursaries, which are intended to enable golfers to combine their studies with competitive play. The R&A’s total annual spend on university golf currently exceeds £320,000 and includes grants to support golf programmes at 12 universities in Great Britain and Ireland. The Old and Eden Courses in St Andrews will provide the venues for The R&A bursars’ tournament in April. For the first time, World Amateur Golf Ranking points are at stake in this event and the winning male student will gain an automatic place in Europe’s 2008 Palmer Cup team to play against the United States of America at Glasgow Gailes at the end of June. In the women’s event, the winner will be offered a place in the field at one of the LET’s tournaments this season.